Cole Custer poses with the trophy in Victory Lane after winning Saturday's NASCAR Xfinity Series race at Auto Club Speedway. FONTANA, Calif. – Thanks to Cole Custer, Kyle Busch will have to wait at least one more day. With a determined run to the finish in Saturday’s Production Alliance Group 300 NASCAR Xfinity Series race at Auto Club Speedway, Custer kept Busch at bay after a restart with 20 laps left and thwarted Busch’s march toward 200 victories across NASCAR’s top three national series. In winning for the third time in his career and the first time at his home track, the Ladera Ranch, California, native grabbed the lead from Christopher Bell on lap 132 of 150 and pulled away to beat Busch to the finish by 1.927 seconds, after Busch passed Bell for second on lap 136. After restarting sixth on lap 131, Busch, who won the first two stages and led 98 laps, couldn’t match Custer’s speed over the last 20 circuits. “Lack of grip there at the end,” said Busch, who will have his next shot at his 200th win in Sunday’s Auto Club 400 Monster Energy NASCAR Cup Series race. “We just didn’t have the speed we needed with the No. 00. “Earlier in the day we were two tenths (of a second) better than some of the guys, and there at the end, we weren’t. It is what it is, I guess… Our Supra was fast, just not enough at the end. At the end there, he (Custer) was really good and really fast and had a good car. They got better throughout the day and got closer to our rear bumper there on that second-to-last run before we had our pit road problems and dropped us back in the pack. Bell held third despite fighting handling issues throughout the afternoon. Polesitter Tyler Reddick recovered from several brushes with the outside wall to run fourth. Chase Briscoe was fifth in the No. 98 Ford. “This year, I can drink,” he quipped. 24. (27) B.J. McLeod, Chevrolet, 143. 28. (10) John Hunter Nemechek #, Chevrolet, Accident, 82. 29. (22) Josh Bilicki, Chevrolet, Vibration, 79. 30. (35) John Jackson, Toyota, Vibration, 50. 31. (34) Morgan Shepherd, Chevrolet, Handling, 43. 32. (24) Chad Finchum, Toyota, Axle, 39. 33. (19) Josh Williams, Chevrolet, Engine, 37. 34. (26) Timmy Hill, Toyota, Transmission, 34. 35. (31) Bayley Currey(i), Chevrolet, Overheating, 14. 36. (32) Jeff Green, Chevrolet, Brakes, 10. 37. (37) Caesar Bacarella, Chevrolet, Vibration, 1. Average Speed of Race Winner: 130.703 mph. Time of Race: 2 Hrs, 17 Mins, 43 Secs. Margin of Victory: 1.927 Seconds. Lap Leaders: T. Reddick 0;K. Busch(i) 1;T. Reddick 2-11;K. Busch(i) 12-86;N. Gragson # 87-89;C. Custer 90-91;K. Busch(i) 92;C. Custer 93;K. Busch(i) 94-114;C. Bell 115-118;C. Custer 119-125;M. Annett 126-130;C. Bell 131;C. Custer 132-150. Leaders Summary: (Driver, Times Lead, Laps Led) Kyle Busch(i) 4 times for 98 laps; Cole Custer 4 times for 29 laps; Tyler Reddick 1 time for 10 laps; Christopher Bell 2 times for 5 laps; Michael Annett 1 time for 5 laps; Noah Gragson # 1 time for 3 laps. Top 10 in Points: 1. Tyler Reddick – 220; 2. 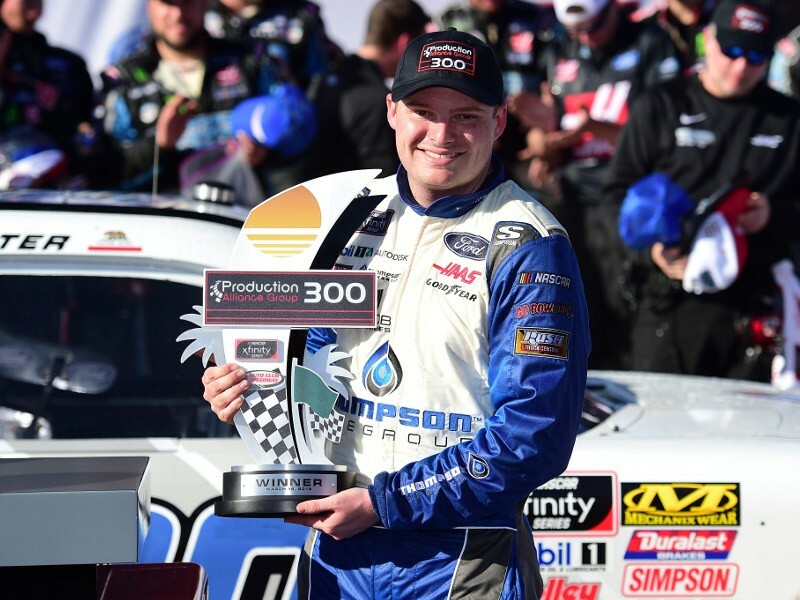 Cole Custer – 213 (1 Win); 3. Christopher Bell – 206 (1 Win); 4. Brandon Jones – 183; 5. Austin Cindric – 179; 6. Michael Annett – 178 (1 Win); 7. Justin Allgaier – 171; 8. Noah Gragson – 161; 9. Ryan Sieg – 153; 10. John Hunter Nemechek – 149.